superpowers that be don't practise what they preach. Why else would the us-- dubbed as the most vocal proponent of free trade -- subvert the liberalisation of agro-commerce, short-changing environmental concerns en route? The us government dealt this twin blow when it recently approved the controversial Farm Security and Rural Investment Act of 2002. The legislation paved the way for subsidising the country's farmers by a whopping us $118 billion in the next six years -- an increase of more than 70 per cent over the amount earmarked in the farm act of 1996. Critics of the 2002 act aver that it promises to derail agricultural trade liberalisation negotiations and give a fillip to perverse subsidies that make environmentally harmful activities, such as excess use of pesticides, more affordable around the world. Rattled by the us' unprecedented policy reversal, even its closest friends in the European Union (eu) and elsewhere howled in protest. In an uncharacteristic display of dismay and remonstration, officials of the World Trade Organisation (wto), International Monetary Fund and World Bank too went public with their criticism of the us farm act. Environmentalists also directed their ire at the country's blatant attempt to forsake environmentally sound policies for gains in domestic politics. us President George Bush said while signing the bill, "Let me put it as plainly as I can: we want to be selling our beef and our corn and our beans to people around the world who need to eat." 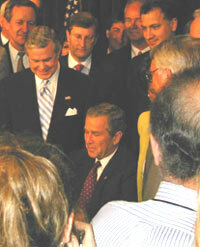 With senate polls due next year, it is claimed that Bush is pandering to the farming-dominant southern states, including Arkansas, Georgia, Iowa, Minnesota and South Dakota, his mainstays in the 2000 elections. "Throw in an important election season and it is difficult" to stop big subsidies, democrat senator Ron Kind from Wisconsin is reported to have said. "It's resulted in (a) bad policy." Jayati Ghosh, professor of economics with the Jawaharlal Nehru University, says: "The us never really reduced its subsidies even under the earlier act. It merely wrapped and hid them in jargon. This time Bush wanted to score brownie points with the domestic constituency, so he did it brashly. Ironically it is not really the us farmers who will gain, but the agro-giants and multinationals." A study by the us-based policy analyst, Environment Working Group, showed that while some Fortune 500 companies got as much as us $375,000 a year in farming subsidies, the average payment to 80 per cent of the recipients (comprising the lowest rung) was only us $5,830. Soft sop The act proposes to hand out lavish subsidies to farmers growing wheat, cotton, corn and other basic crops (see Salient features of the act). This is despite the fact that there is a glut of many of these crops in the global market and prices have been depressed for the past few years. Agricultural and farm product subsidies have always hit the farmers in developing nations the worst. They are unable to match the market prices that are kept at an artificial low. According to World Bank estimates, cotton exporters in West and Central Africa would take in an additional us $250 million a year if the us stopped subsidising domestic production. The us $2 billion in subsidies received by the country's cotton farmers every year is partly to blame, the World Bank asserts. Worse still, following the new act these subsidies are set to balloon. "Commodity prices could sink lower on a global basis. For countries that do not subsidise their farmers as well as we do, that will mean economic and financial trauma," says Neil Harl, director of the Center for International Agricultural Finance at Iowa State University, usa. "The us is taking decisions that affect the entire world, yet the rest of the world doesn't have much say in what its policy is." Revealing the Indian stand, Union minister for agriculture Ajit Singh slammed the act in a South Asian Association for Regional Cooperation (saarc) meeting in Kathmandu: "The developing countries were already struggling to retain their comparative edge in some agricultural commodities. The erosion of this advantage would directly hit the food and livelihood security of millions." Many countries, including Australia and some members of the eu, are contemplating dragging the us to the wto dispute appellate tribunal. Franz Fischler, eu commissioner for agriculture, rural development and fisheries, said in a gathering of member-nations: "I am astonished by claims made in the us congress that much of these price-linked subsidies would not be counted against us commitments (to cap subsidies under the wto)." As per its rules, certain subsidies are capped under what is called the 'aggregate minimum subsidies (ams) limit'. The us is supposed to limit its price-linked or production-linked subsidies under the regulations to us $19.1 billion per annum. Whether us subsidies exceed the limit under the new act will depend heavily upon how it decides to classify subsidies and prevailing global crop prices. But it can be inferred from its subsidy disbursal structure under the new act that the lower the prices in the market, the greater will be the dollar support that the farmer can claim. In addition to this, a plethora of implicit subsidies through income support programmes will remain outside the purview of the regulation that requires the amount to be capped. New Delhi-based food policy analyst Devendra Sharma points out that European countries are not far behind in the subsidy game (see table: How the us and eu stack up). He says, "The Organisation for Economic Cooperation and Development (oecd) members provide subsidies to the tune of about us $1 billion a day under categories such as conservation subsidies." Indeed, generous farm subsidies given by other industrialised nations -- especially France and Japan -- have long been the target of criticism by us trade negotiators as inimical to the cause of free trade. Such huge subsidies by developed nations not only help manipulate the markets of food crops, but also those of ancillary agricultural inputs such as fertilisers. Ghosh says, "The subsidies always come with strings attached. Farmers only get them when they have committed to buying particular fertilisers and seeds." In India, too, such perverse subsidies have a role to play in ruining farmers' livelihoods, adversely affecting the food security scenario and degrading the environment. Only, the amount offered to Indian farmers is minuscule as compared to what their counterparts in the us get. "The us has, till now, distributed an average of us $30,000 in subsidies per farm annually," says Sharma. In comparison, the average annual per capita income of an Indian farmer is only about us $360, says Ghosh. The total annual subsidies for agriculture in India amount to only about us $1 billion, reveals Sharma (see graph: The Indian dip). An oecd study shows that the average annual subsidies per full-time farmer are us $20,000 in usa and about us $14,000 in oecd countries. "While India and other developing nations have done away with their quantitative restrictions on imports of agricultural products, the developed countries openly challenge the very regime they have always promoted," laments Ghosh. "It is a double whammy for Indian farmers. You take away their support system leaving them exposed to the vagaries of the market, and then other countries pump money into the market to bend it in their favour." The Indian bureaucracy has left the country's farmer in the lurch, feels Ghosh. That resentment is brewing among farmers is evident from their violent agitation in Jind district of Haryana. The crisis, which was sparked by the state government's refusal to waive the farmers' power dues and withdraw criminal cases against them, reached a flashpoint recently. Though a secret pact is said to have been struck to end the impasse, truce seems fragile. Sharma says, "India needs to put its house in order, but we cannot allow developed nations to get away with their diabolical deals." Biswajit Dhar, senior fellow at the Delhi-based Research and Information System for the Non-aligned and Other Developing Countries, points out that some eu members of oecd are talking today of getting more subsidies out of wto's ambit by terming them as multifunctional -- helping causes beyond that of the farmers. "Tomorrow, the eu and the us may strike a deal, allowing each others' subsidy systems to go unchallenged in the wto. In such a scenario, only developing nations like India and China will end up as losers."